5 Days to help you get moving beyond the natural "negativity bias of the mind" and orienting toward abundance, possibility and gratitude. 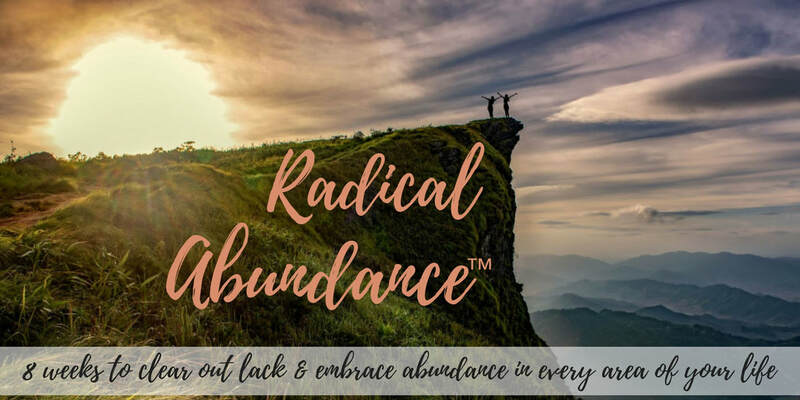 You're invited to transform the lies of scarcity into prosperity & abundance consciousness over two months in the Radical Abundance Online 8 Week Course. & clear the space for the creations, travel, relationship & abundance that light you up. 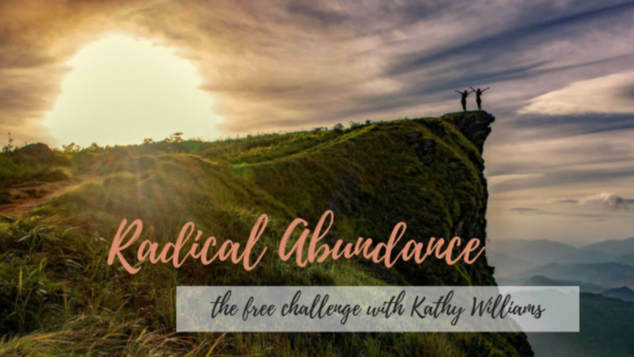 ​Enjoy weekly time with Kathy via Zoom + bite-size videos & audio exercises that you can use to get beyond stuckness and create a life of abundance. Your way. Day 1 Challenge: ​Can you Be/Maintain the vibration of abundance no matter what (despite your past history & all the evidence/reasons you have not to)? The way you Show Up changes things. If your vibration is lack, judgment & projections about money, would money like to join your party? ​What is abundance to you? Tap into the energy of that. What would it be like if you had it fully? If you could be, do, have, or create anything, what would it be? ​How would you live if nothing were a problem? ​Would you be willing to see how everything that arises in our lives is an invitation to even greater possibilities? What are you already abundant in? How wonderful would it be to live in a world in which people live in possibility, prosperity and consciousness, and not buy into the lies of scarcity? Do you have an abundance of the lies of scarcity in your life? there's not enough to go around, there's not enough time, money, energy, health, etc. Keep asking, what am I abundant in? Acknowledging abundance draws in more of it. Gratitude is a muscle that we get to exercise. When we do, the gratitude muscle strengthens and we come out of judgment. Even in the challenging moments ask: "What's the gift here?" "What are the possibilities of this creating something even greater?" "How can I use this to create even greater possibilities?" If you'd like to take it a step further... Where in your life have you asked and had things magically show up? By acknowledging those, you create more of them too. ​What points of view do you have limiting the abundance, money & riches that can show up for you? Here's an energy pull exercise for today. ​In the video, I mentioned communicating with your projects by asking questions like, "Is now the time?" Energetic Exercises & Pulls for Creation is one of my most popular products with 5 different exercises for creating projects, adventures, business, classes in easier & greater ways. a) your energy/vibration b) what you’re telling yourself, including your stories, reasons & justifications of possibility or impossibility. 2. What you’re doing in the world… if you receive awareness of actions to take but then never take them, you’ll sabotaging yourself & your creations. I like to see this as four A’s. & be aware that no matter where you are & if something doesn't work out the way you thought it would, there are Always possibilities to create something greater in any given moment. What would your life blossom into if you'd get out of your own way?